Tehran launches “Omid,” or “Hope” satellite amid 30th anniversary celebrations of Islamic revolution. In the first concrete overture by the Obama administration to Iran, Secretary of State Hillary Clinton has invited diplomats from Tehran to attend an international conference on Afghanistan on March 31. For the past several years, the United States has had no official contacts with Iran, other than severely circumscribed talks between the United States and Iran in Baghdad that focused solely on Iraq. President Obama wants a dialogue with Iran that is expected to include a wide range of issues, including Iran’s nuclear research program and Tehran’s support of Hezbollah and Hamas. Problem is, a key official involved is Dennis Ross, a staunch opponent of Iran who, until recently, served as a top official of the Washington Institute for Near East Policy. The think tank is an integral part of the pro-Israel lobby in Washington and Ross, a former U.S. special envoy to Middle East, is widely seen as biased in favor of the Israelis. On Wednesday, Ross was a signatory to an alarmist report on Iran’s nuclear program, issued by the Washington Institute, that warned that U.S. flexibility in dealing with Iran’s nuclear program is limited by the possibility that Israel may decide to attack Iran unilaterally, and quite soon. “Time is short,” said the report. The appointment of Ross was controversial. Originally, it appeared as if Ross was slated to be a special envoy for President Obama vis-à-vis Iran, much as George Mitchell and Richard Holbrooke serve as special envoys to the Middle East and Afghanistan-Pakistan. After a long delay, however, Ross was quietly announced as a mere “special adviser” to Clinton on “the Gulf and Southwest Asia.” Still, despite that lower-profile post, Ross is expected to have significant influence over U.S. policy toward Iran. It’s hard to imagine anyone less well-suited to be involved in U.S. policy toward Iran. Virtually all of Ross’ diplomatic experience is tied to the Israel-Palestine dispute, and he has little or no experience in dealing with Iran. Worse, late last year Ross was co-founder of a hawkish group called United Against Nuclear Iran, which calls Iran “a danger to world peace” and says that its mission is to warn Americans about that danger. Perhaps Clinton’s appointment of Ross was designed to appease Israel’s supporters in Washington, who are fearful about a U.S.-Iran dialogue. But it isn’t a move likely to be well received in Tehran, where the reaction to Ross will range from suspicious to hostile. It’s true that with the arrival of an ultra-hawkish government in Israel led by Bibi Netanyahu of Likud and including Avigdor Lieberman’s far-right movement, the possibility of an Israeli strike on Iran is once again a real possibility. Such an attack would have catastrophic repercussions, leading to greater violence in places where Iran has influence — including Iraq, Afghanistan, Lebanon, and Palestine — perhaps even igniting a war between the United States and Iran. The proper United States approach to the issue ought to be to warn Israel that an attack on Iran is utterly unacceptable and, furthermore, that if Israel were to carry out such an action it would be opposed by the United States and face consequences that would include the suspension of U.S. military and economic support. It does no good at all, as Ross does in the Washington Institute report, to hold the threat of Israeli action over the head of the United States as some sort of deadline for U.S. success in negotiating a deal with Iran over its nuclear program. Contrary to the Washington Institute report, time is not short in talking to Iran. Iran has no bomb-grade uranium. It may lack the know-how to make a bomb. And so far at least, Iran does not have the means to deliver a bomb. Hillary Clinton does herself no favors when she declares, as she recently told an Arab diplomat, that “it’s doubtful that Iran would respond” to a U.S. offer to negotiate. Despite bluster and tough talk from top Iranian leaders, Iran has also been sending positive signals of late that it wants a dialogue. Those who eventually take part in the coming talks, on both sides, will have to realize going in that the talks may take months, if not years. But succeed they must. Alarmist talk from Dennis Ross and others that the talks will operate under an artificial, urgent deadline will only serve to undermine the possibility of that success. Robert Dreyfuss, a regular Tehran Bureau contributor, is the author of Devil’s Game: How the United States Helped Unleash Fundamentalist Islam (Metropolitan). Copyright © 2009 Tehran Bureau — distributed by Agence Global. Anger is boiling over in the Middle East over Gaza, and the result of the war has been to boost radicalism throughout the region, to strengthen the terrorist-inclined fanatics of Hamas, and to enhance the muscle of terrorist-inclined Israelis, including far-right parties such as Avigdor Lieberman’s Yisrael Beiteinu and, of course, Likud’s bombastic Benjamin Netanyahu. Speaking on January 14 at the New America Foundation, the outgoing U.S. ambassador to the UN, Zalmay Khalilizad, said explicitly that the United States feared a violent explosion in the region, including the seizure of U.S. embassies by angry mobs, if the United States continued to block action by the UN. A central concern, said Khalilzad, is that mosque leaders all over the Middle East would mobilize the anger and direct it against the United States. “In the past weeks, not only have the Israeli Defense Forces murdered more than 1,000 Palestinians, but they have come close to killing the prospect of peace itself. Unless the new U.S. administration takes forceful steps to prevent any further suffering and slaughter of Palestinians, the peace process, the U.S.-Saudi relationship and the stability of the region are at risk…. “Last week, President Mahmoud Ahmadinejad of Iran wrote a letter to King Abdullah, explicitly recognizing Saudi Arabia as the leader of the Arab and Muslim worlds and calling on him to take a more confrontational role over ‘this obvious atrocity and killing of your own children’ in Gaza. The communiqué is significant because the de facto recognition of the kingdom’s primacy from one of its most ardent foes reveals the extent that the war has united an entire region, both Shia and Sunni. 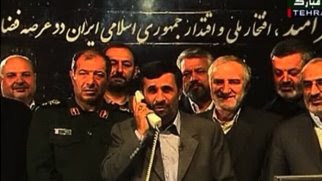 Further, Mr. Ahmadinejad’s call for Saudi Arabia to lead a jihad against Israel would, if pursued, create unprecedented chaos and bloodshed in the region. So: a top U.S. official says that American embassies were on the verge of being “overrun” by mobs, and a top Saudi official warns that his government is finding it hard to resist a “jihad” along with Iran. Copyright 2009, The Nation, used with permission of Agence Global.